With one day until the presidential election, Hillary Clinton has a small lead over Donald Trump. 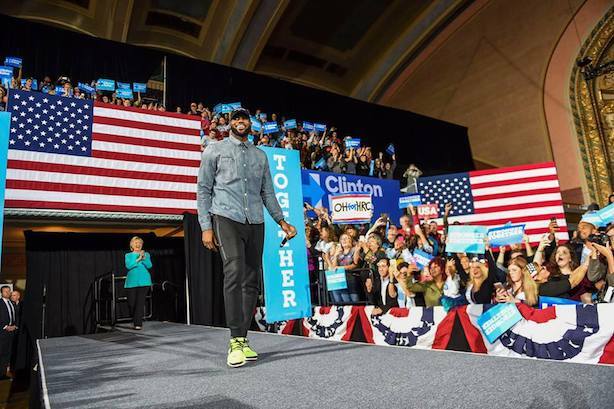 LeBron James campaigned for Hillary Clinton in Cleveland on Sunday. (Image via Facebook). FBI: Nothing to see here…More than a week after FBI Director James Comey wrote a letter to members of Congress saying the bureau was reopening its investigation into emails related to Hillary Clinton, he told lawmakers on Sunday that it has not changed its opinion from July. While Comey criticized Clinton’s use of a private email server this summer, he said at the time she should not face criminal charges. Global financial markets were up on the news. Obama lets it fly at Florida campaign stop. President Obama was even more critical of Donald Trump than usual at a Sunday campaign stop in Florida, telling the crowd, "If someone can’t handle a Twitter account, they can’t handle the nuclear codes." The president singled out Trump’s misrepresentation of Obama’s handling of an event protester on Friday. Polls show Clinton lead. The final NBC News/Wall Street Journal poll showed a four-point lead for Hillary Clinton, the same as the previous week. Bloomberg’s final poll has Clinton leading Trump by three points nationally, though it surveyed voters before Comey announced the FBI was sticking with its earlier decision to not recommend charges against Clinton. Nate Silver’s verdict: Clinton is ahead, but it’s a close race. Philly transit strike over. Southeastern Pennsylvania’s SEPTA mass transit system has reached an agreement with its employee union, meaning trains and buses will be running on Election Day. Democrats had feared that a transit strike in the critical state could have dampened turnout. LeBron takes to the stump. Basketball superstar LeBron James campaigned for Clinton on Sunday in Cleveland, and Khizr Khan stumped for the former secretary of state in New Hampshire. Clinton is striking a broad tone about bringing the country together in the final hours of her campaign, and her team is forking over millions to run a two-minute ad nationally with unifying themes.